The acronym CMS stands for "Compact Muon Solenoid". 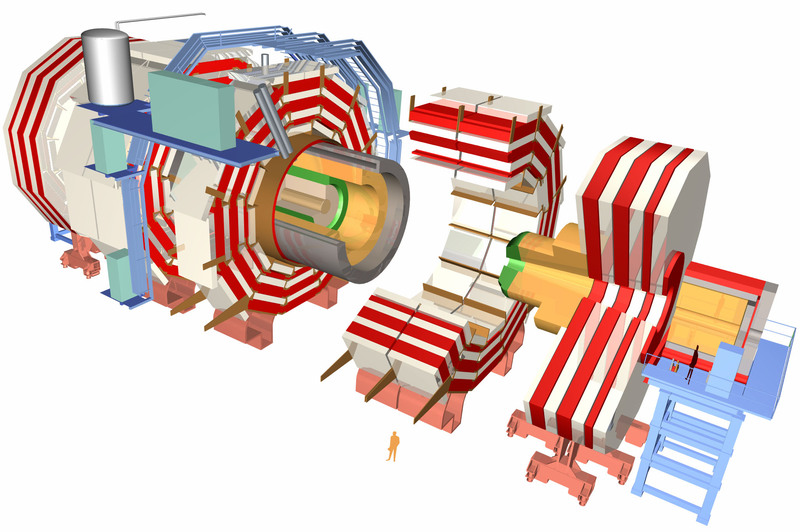 Most detectors for particle physics are based around a magnet system, of one sort or another, to facilitate the measurement of the momenta of charged particles. CMS is no exception: we have decided to use a large superconducting Solenoid, with a length of around 12m and an inner diameter of about 6m. The field strength is 4 Tesla - about 100000 times that of the earth's magnetic field. This is the largest magnet of its type ever constructed, and allows all of the tracking devices and calorimetry to be placed inside the coil of the solenoid - resulting in a Compact overall detector. Outside of the coil there is a steel "return yoke". This yoke is built in layers, interspersed with muon detectors; the configuration of the magnetic field means that the momentum of muons is measured both inside the coil (by the tracking devices) and outside of the coil (by the muon chambers). Muons are extremely important in particle physics as they signify that "something interesting has happened" so can be used to help find that elusive "needle in a haystack". The complete CMS detector is about 21m long, with a diameter of about 16m and weighs in excess of 12500 tonnes. Even if the access shaft was large enough to accomodate the complete detector (as large as the underground cavern!) it was not possible to lower the detector down into the cavern. A modular design allowed CMS to be constructed, and tested, in pieces. Using data collected up to June 2012 CMS has observed an excess of events at a mass of approximately 125 GeV with a statistical significance of more than five standard deviations above background expectations. The probability of the background alone fluctuating up by this amount or more is about one in three million. The evidence is strongest in the two final states with the best mass resolution: first the two-photon final state and second the final state with two pairs of charged leptons (electrons or muons). For this mass, the decay width is in the order of a few score of keV - the measured mass resolution in the two-photons final state is entirely dominated by the energy resolution of the electromagnetic calorimeter (ECAL) used to detect and measure the photons. That is the reason why CMS has placed such great emphasis on the performance of its ECAL. CMS has interpreted this to be due to the production of a previously unobserved particle with a mass of around 125 GeV. The new particle observed at about 125 GeV is compatible, within the limited statistical accuracy, with being the Standard Model Higgs boson. However, more data are required to measure its properties such as decay rates in the various channels (γγ, ZZ, WW, bb and ττ) and ultimately its spin and parity, and hence ascertain whether it is indeed the Standard Model Higgs boson or the result of new physics. In 2013 Peter Higgs and François Englert were awarded the Nobel Prize for Physics, for their independent prediction of the existence of the Higgs boson. The Trieste group has been involved since many years in various sectors of the experiment, having contributed to the activities of the electromagnetic calorimeter and to the development and management of software and computing systems of the Collaboration. The group also participates in precision studies of the Standard Model processes that are important backgrounds for searches of new physics.